KHB Photografix is Canada's leading photographic repair facility for the professional photographic industry. 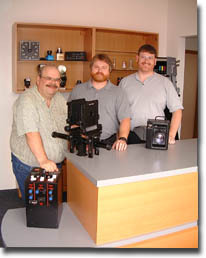 We specialize in equipment that other repair facilities normally do not handle - studio flash, enlargers, large format and specialty professional film cameras. Now in our twenty-ninth year of business, KHB Photografix has expanded to provide specialty service parts, and has become Canada's leading source for enlargers and professional darkroom equipment. Our staff would be pleased to assist you and answer any inquires you may have.